Vehicles built today are a lot more advanced and technical than ones built even a few year ago. It can be confusing when trying to determine who is best qualified to work on your vehicle. 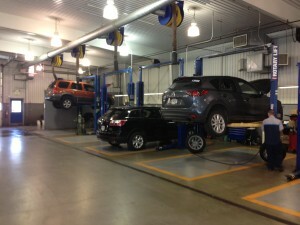 The terms “service technician” and “auto mechanic” may refer to the same job but they are not the same. While both positions require ample knowledge about automobiles, each position has its own area of expertise and training standards. Mechanics deal more with the mechanical aspects of a vehicles repair; the nuts and bolts if you will. They will often be able to work on several different types of vehicles but may not have the factory training or access to specialty tools needed to work on the latest models on the road. A service technician has been specially trained to handle the technical computer and sensor aspects of a vehicle along with the mechanics. Technicians will have completed factory training courses, ASE Certifications and will likely be more knowledgeable about the newer models of vehicles. If the service technician works for a car dealership they should be the most experience people to work on the type of vehicles sold at the dealership. The dealership will have all the needed specialty tools and diagnosis equipment and is the only place where warranty work can be done. The need for service technicians came after the introduction of a new computer system in 1996. With the introduction of the Onboard Diagnostics Generation 2 system, car designers started using computers to monitor systems operations within vehicles. These systems made it easier to diagnose a problem, but required a lot of additional training to make the needed repairs. When the new computer systems were first being introduced to new vehicles, mechanics had to learn how to work the systems. As time went on, and these systems became more complex, the need for workers who were trained to understand and control the programs increased, creating the service technician position. Today it would be very difficult for a mechanic with only basic training to make a complex repair to new vehicle based on not having the correct diagnostic and specialty tools. Neither a mechanic nor a service technician is necessarily better than the other but service technicians typically have more training and are the true experts on today’s vehicles. Who you need depends on the vehicle that needs to be worked on or the problem that the vehicle has. If the vehicle in need of a repair is older, and it doesn’t have a computer system, a mechanic may be the right person for the job but of course a technician can work on any vehicle. If the vehicle is newer, then a service technician should probably be the one to do the repairs. Either way, both a service technician and a mechanic are trained to work on and repair automobiles. You can always ask a dealership or independent garage who they employee and what levels of training they have. It pays to do a little research to make sure the company you hire is qualified and able to make the repairs. If you need an oil change, new brakes, or any other service, here’s a link to some coupons for local service shops. Who do you want doing your repairs, a service technician or an auto mechanic? Under what circumstances would you want a service tech instead of an auto mechanic? Leave a comment in the box below. Posted in Ask A Tech, Maintenance, Warranty and tagged Automotive, mechanic, technician, training. ← Don’t Text and Drive…PLEASE.